Kailey Doutt’s coaches, teammates and parents have told her to shoot more for years. This season she finally did and the result was the league’s biggest individual prize as Doutt was voted Greater Valley Conference Girls Basketball Player of the Year. Doutt, who averaged 18.4 points and 6.9 rebounds this season, thought she had a chance at winning the award. Doutt showed she was in the running for the league’s best player early on, making 15 of 17 shots for 32 points and eight rebounds against Tualatin on Dec. 2. Playing in the Nike Shootout at Lake Oswego, Doutt then posted a double-double of 33 points and 15 rebounds against West Albany on Dec. 29. Doutt’s biggest shot came in the final seconds off a 30-29 win at Forest Grove on Jan. 30. Her younger sister, Leah, a freshman on the team, had the assist on the play. 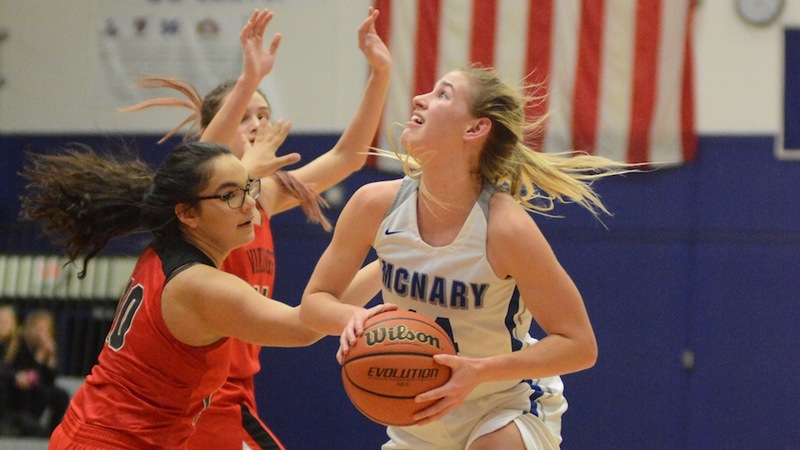 McNary finished the season 17-8 overall and 11-5 in league play. Senior Paige Downer and junior Abbie Hawley were voted to the All-GVC Second Team. Junior Sabella Alfaro was an honorable mention pick.